Once upon a time, the web was a straightforward affair. Lots of links - to lots and lots and lots of text. A decade on, it is virtually unrecognisable - a multimedia extravaganza where text has to compete with video, podcasts and animation. Enriching? Definitely. But daunting, and very, very noisy as well. So how do you tune out that noise and tune in to stuff you do want? Enter the concept of filtering - and enter alongside it, rock legend-turned-serial tech investor Peter Gabriel. "It's one thing to have access to unlimited information," he says. "But you feel like you're drowning sometimes - there's just too much stuff, and you really want the good stuff, the stuff that's going to excite and inspire you," he adds. 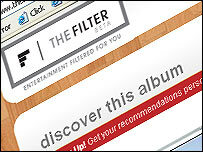 Three years ago the former Genesis frontman gave his backing to an iTunes plug-in called "The Filter", which was designed to automatically generate playlists from your music collection. Now it has relaunched as a website with the more ambitious goal of being a "life jockey"; actually learning your taste in entertainment, and delivering appropriate content to you. It takes a mathematical approach to work out the probability that you will like something based on your designated preferences. This analysis is then combined with other people's playlists and purchases to produce - fingers crossed - a list of media suited to your taste. "It's trying to say actually how do we make good choices - and that's partly through expert systems and algorithms," says Peter Gabriel. "It's also partly through people that we trust - friends, experts - so we're trying to integrate a system which takes the best of man and machine." This time round it is not just music that The Filter has in its sights. Web, video and even movies are all part of the taste-predicting experience. "We believe there maybe some real relationships worth exploring," he says. "A very obvious example would be if I love Goth films, I may also like Goth music. If I like obscure foreign language arthouse films, then I may tend to obscure music." But he accepts it is ambitious to make definite conclusions. "It's only as good as the usage the community gives it, so the bigger the database of information and references, the better the predictions. "Some maybe totally fanciful, but I think the more we look at it, the more it seems that there are connections you can make," he adds. And, he says, users will still be able to find the unpredictable "left-field" material for which the internet is famed. "On the site there's a bar which has got 'expected' and 'unexpected'. So, if you feel like an experimental day when you want all new stuff, unfamiliar things, you can select that," he says. "If you want more tried and tested, that's available too." The concept of recommendation sites is nothing new, as any visitor to Amazon will know. And whilst The Filter has celebrity backing, other similar filtering sites have become stars in their own right. 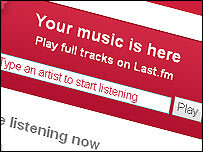 Start-up Last.fm was snapped up by CBS last year for a cool $280m (£143m) and iLike boasts 20 million users. Pandora employs an entirely unique approach, looking at musical attributes in songs you like - things like vocal harmony and orchestration - and then trying to find the same attributes in other music. 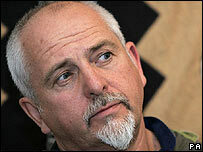 Peter Gabriel accepts The Filter faces stiff competition from the other sites operating in this area. "For sure, we're behind," he admits. "We're a small English operation and we don't have some of the resources. "I think Last.fm did the social network side of the music thing very well and it's a well-designed, well-executed site. "I just think we're doing something a bit different, and filtering is coming in a big way. So I hope we can do it well, and we've certainly got some very smart people working on it."